Happy Labor Day! We partied yesterday. . today I lay low! Maybe make some more of these! Remember how I told you about my granola addiction? This falls into the same category. It’s sticky, chewy granola. But in bar form. I’m pretty sure these are a little like crack. (Not that I’d know what that is like, of course!) You know. .they’re addicting. I feel a little like a dealer handing these out. Like a little free sample of granola bar to get ya hooked and then you’ll want more and more and I’ll start charging you more and more! BWA HA HA HA! 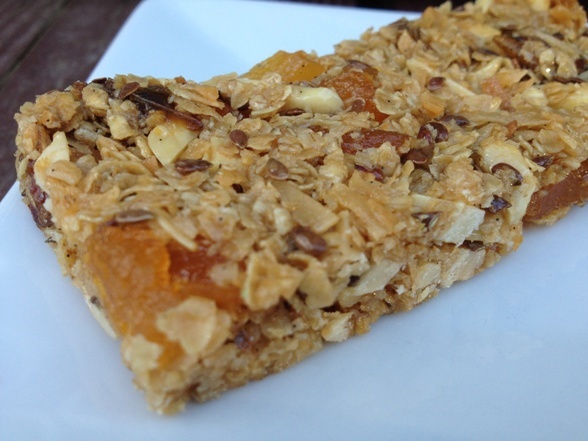 Posted in Sweet and tagged almonds, coconut, dried apricot, dried dates, flax seeds, granola bars, honey, oatmeal. Bookmark the permalink. Welcome to Sugar Coated Sarah! This is my blog about baking and cooking and my assorted, random life. Thanks for visiting.